September 15, 2010 - At a special TUC fringe meeting organized by the Daily Mirror, British Air Line Pilots' Association (BALPA) raised the growing use of self employed pilots in Ryanair. The fringe meeting heard from ‘employees’ in the building, taxi and pub industry who were to all intents and purposes ‘employed’ but whose ‘employer’ exploited a grey area in the law to categorize them as self-employed and take them out of sick pay, holiday pay, pension entitlement and a whole host of health and safety measures. A BUDGET airline boss has been criticized for his "horrifying" proposal to employ just one pilot on flights with back-up only from an air stewardess. Ryanair boss Michael O'Leary turned his focus on the cockpit as part of his ongoing drive to save money at the cost-cutting operator. He plans to write to aviation authorities for permission to use only one pilot per flight because he believes co-pilots are unnecessary on modern jets. BALPA highlighted that the second pilot is there as insurance for the incapacitation of the first pilot and asked whether single engine airliners might also be introduced so convinced is Mr. O’Leary of reliability! BALPA explained that although the co-pilot is there to deal with incapacitation, he or she is also there as an apprentice to learn the role of airline pilot and to gain experience. The parallel is, would MOL be happy for a nurse to complete his surgery if the surgeon is indisposed? Alternatively should there be an apprentice surgeon present to learn the skills required and eventually apply them successfully when fully trained with a further apprentice alongside? Irish airline Ryanair is also the target of letters in the Financial Times from our sister organization. Sir, I refer to “Ryanair’s talk of spree on aircraft casts cloud over dividend hopes” (September 8) where Michael O’Leary is quoted as saying that the risk of pilot incapacitation does not merit the presence or cost of a qualified co-pilot. Mr. O’Leary is notably skilful at obtaining publicity by means of outrageous statements that the media find newsworthy. However, his misrepresentations in this case demand clarification. His claims that there was only one such incident in 25 years and that the pilot “landed the plane” are incorrect. In fact, there have been at least two significant events in Ryanair involving crew member incapacitation. In the reported event, the physicians who eventually reached the cockpit determined the captain to be clinically dead. (While he was revived following strenuous efforts he subsequently died.) The captain did not land the aircraft, as was claimed by Mr. O’Leary. However, the safety outcome was well within tolerances expected in such rare events. This testifies to the key role played by the co-pilot. In the second incident, the incapacity of a captain gave rise to potentially grave consequences that exceeded acceptable safety tolerances. The safety implications are obvious, as is the reason for having two qualified pilots in the cockpit. In respect of Mr. O’Leary’s comments, members of the deceased captain’s family wish that these matters be clarified. I therefore write to you on their behalf as well as that of my organization. The family note that the official accident report contains references to failures of training in pilot incapacitation provided to the cabin crew, as well as the elapsed time prior to providing the captain with oxygen and medical assistance. In fact, this most unfortunate event evokes for them unpleasant memories that go beyond the immediate operational consequences of pilot incapacitation. Their appreciation of all the events and circumstances surrounding the incapacitation event is very different from that represented by Mr O’Leary. Mr. O’Leary has been on the board of Ryanair since 1988 and chief executive since 1994. That he is prepared to make such statements while, apparently, not being fully briefed on these important safety matters is entirely consistent with Ryanair’s “innovative” approach to staff relations, safety, pilot fatigue and related matters. Sir, I would like to share with you a cost-saving suggestion I have proposed to the Ryanair board (“Ryanair’s talk of spree on aircraft casts cloud over dividend hopes”, September 8). I write in my capacity as a B737-800 line training captain assigned to Ryanair’s Marseilles, France base. My primary job responsibility involves the line training and checking of co-pilots and captains on both an initial and a recurrent basis. As a Ryanair employee, I am aware of the company’s desire to reduce costs whenever feasible, and, in so doing, pass on these lower costs in the form of lower fares to the travelling public. I would propose that Ryanair replace the chief executive with a probationary cabin crew member currently earning about €13,200 net a year. Ryanair would benefit by saving millions of Euros in salary, benefits and stock options. Further, there will be no need to petition either Boeing or governmental aviation regulators for approval to replace the CEO with a cabin crew member; as such approval would not be required. Finally, the position of CEO could, in fact, become a source of ancillary revenue for Ryanair. Currently, Ryanair’s contract cabin crew providers charge new recruits for the cost of their training – €3,000 in fact. 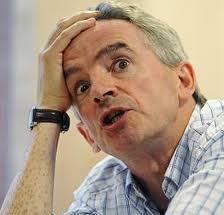 Ryanair could similarly charge €3,000 for the training required to become chief executive. At the TUC this week BALPA made it clear that it would be opting out of a call for coordinated industrial action across all unions over public sector cuts unless members decided differently.